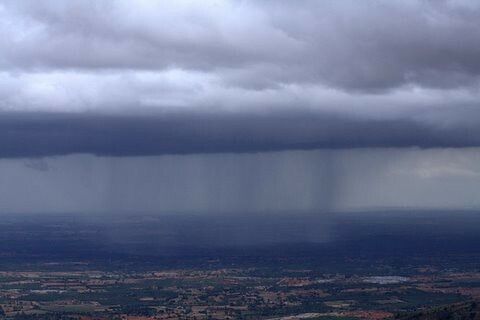 Taken at Nandi Hills, 23 June, 2007…exactly six years ago! Right now, a storm is raging outside, here in St.Louis. The clouds gather, and darken. Heavy, bearing water, they scud along. Low-hanging, in cottony shreds, Higher up, boiling, as if The water in them were Hot, instead of icy cold. The breeze stiffens, too. Coolness, welcome after the heat, Pervades the very air. The trees sway in the rising wind, And that eerie light, that presages a storm Makes the whole scene glow. Lightning forks down…majestic, awe-inspiring. The thunder follows, scary claps, or distant rumbles. The first big, fat, drops fall And dry at once, on the hot footpath. But more and more follow, Until it’s a stream of water Falling from the sky. It sounds trite and traditional, But the hearts of sundered lovers Yearn to be together again. Children, on the other hand, Hold on to their parents And try to swallow their fear Of the elemental forces. The monsoon’s begun…the wonderful, unique “Smell-of-the-earth”, that comes with the first touch Of rainwater, on the parched earth, Raises emotions in our hearts, Even as beasts and birds Scurry for shelter, or stand patiently, Drenched in the sustained downpour With which Nature renews her annual promise To her sister, the Earth.